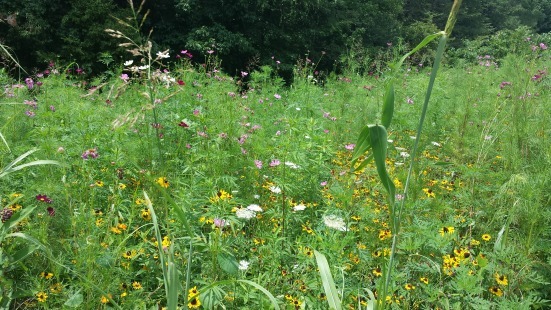 Did you know there’s a wildflower meadow at Shallow Ford Natural Area? With the arrival of spring and the warming weather, the flowers are starting to bloom and it’s a great time to visit. Early flowers are already showing their colors, including Sweet Williams (Dianthus barbatus), the Siberian Wallflower (Cheiranthus allionii), and a variety of daisies (Leucanthemum spp.). These are only the beginning, with many more to come as the season progresses, including Black-eyed Susan (Rudbeckia hirta), Blanket Flower (Gaillardia spp. ), Queen Anne’s Lace a.k.a. Wild Carrot (Daucus carota subsp. carota), and more! As you can see in the photos, last year we enjoyed these flowers and many others, including some stunning giant sunflowers (Helianthus spp.) and widespread Cosmos (Cosmos spp.) in all shades of purple and pink. What’s special this year is that we will be seeing the first blooms from biennials planted last year and some of our perennials (read on to learn about the difference between annuals, biennials, and perennials). The Observation Deck seen through a screen of tall Cosmos in summer 2015. The Observation Deck located on the Basin Creek Trail (Orange Trail) was built last year to overlook the old field that has been converted into this home for wildflowers and wildlife. Last year, steps were taken to establish the wildflower meadow by seeding a portion of the area with a 60/40 perennial/annual mix. This year, a 70/30 perennial/annual mix was added to help finish establishing the field. Each year, a different annual mix will be added to the field for variety and experimentation, so you will always be able to enjoy something new! The meadow is set up so you can enjoy a panoramic view from the observation deck, or immerse yourself in the flowers by strolling mown paths between the different flower sections. Flowers beginning to bloom amidst the paths in spring 2016. The meadow creates an amazing ecosystem attracting all kinds of wildlife. In fact, this was one of the criteria in the original flower selection. Not only did we want flowers that show well and are hardy survivors, we also wanted to attract wildlife for observers to enjoy. The flower seed mixes were carefully selected to include plants both native to this area and from nearby regions. Some of the selected wildflowers are actually improved varieties of native wildflowers, meaning they’ve been bred from the original wild-type to have desirable qualities such as drought tolerance or nicer blooms. The meadow attracts a variety of insects including butterflies, moths, different types of bees, and grasshoppers, as well as birds and other animals. Last year, we saw clearwing hummingbird moths (Hemaris spp. ), which are a type of moth that looks and moves like a little hummingbird and is active during the day (you can learn more about these moths on the US Forest Service Website). The milkweed (Asclepias spp.) in certain areas of the field will remain uncut to encourage the Monarch Butterfly (Danaus plexippus) population. Monarch butterfly caterpillars only eat milkweed plants, making these plants essential to Monarch survival and great attractants for these beautiful butterflies. Milkweed plants form scaly green seed pods that dry up and release seeds attached to fluffy white filaments that cluster to form a coma, which helps the seeds wind-disperse. Milkweed is named for its latex-based milky sap. Milkweed plant with seed pods forming. The flowers will continue to bloom throughout the summer and the types of flowers in bloom at any given time may vary, so be sure to visit more than once! Unless you’re already a plant enthusiast, by now you’re probably wondering what exactly perennial, biennial, and annual means…and why it matters for the wildflower meadow! These terms refer to a plant’s life cycle. An annual plant is one that completes its entire life cycle- from seed to vegetation to flowering then back to seed and death- in a single growing season (within one year, hence “annual”). The seeds may remain and grow into new plants the following year if conditions are right, but the parent plant dies after seed. Many Cosmos are annuals, and others include Cornflowers (Centaurea), Coreopsis, and Red Poppy (Papaver rhoeas). A biennial plant takes two years to complete its life cycle- the first year is devoted to vegetative growth, meaning roots and foliage but not flowers or seed. It’s in the second year that you get flowers and seed, then the parent plant dies. So, for an example in the wildflower meadow, the Sweet Williams and Siberian Wallflowers that were seeded last year are blooming for the very first time this year! Some other common biennials include Foxgloves (Digitalis spp. ), Brussels sprouts (Brassica oleracea), Celery (Apium graveolens), and some Blanket Flowers. A perennial plant’s life cycle can take two or more years to complete from seed to seed. Generally, you will get flowers by the second year, but not always. The difference between perennials and annuals or biennials is that the parent plant of a perennial does not die after producing seeds. Parts of the plant may die back to the ground over winter but will sprout again come spring. Some varieties of Black Eyed Susan, Sunflowers, and Blanket Flowers are perennials. Other common perennials include Purple Coneflower (Echinacea spp. ), Ox-Eye Daisy (Leucanthemum vulgare), and other species of Daisies. The terms can get a little confusing because some plants behave differently depending on the geographic region they are growing in and its climate. Also, for many plants, hybrids and different varieties have been produced that may demonstrate different life cycles than the original plant. For example, there are both annual and perennial varieties of Sunflowers and Black Eyed Susan. To learn more about perennials, biennials, annuals, and wildflowers, try visiting the National Garden Association’s website, the Texas Cooperative Extension’s “Wildflowers in Bloom” website, the Learn2Grow gardening website, or the American Meadows website. You can also learn more about specific flower types on Wikipedia. Sweet Williams, in bloom now! Siberian Wallflowers and others, also in bloom now!